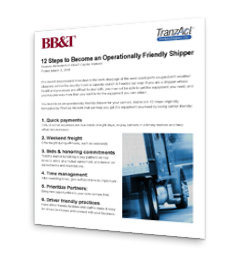 Learn what you can do to to become a shipper that carriers like doing business with. These steps were created by Thomas Albrecht, Managing Director and Senior Equity Research Analyst in the Transportation Group at BB&T. About Thomas Albrecht: He is a seven-time Wall Street Journal All-Star, according to its annual rankings of analysts, and he has been a featured speaker at several American Trucking Association conferences. He has been recognized by Institutional Investor magazine as best analyst in his sector among regional/boutique firms for eight straight years. In its "World’s Top Analysts" survey recognizing the top analysts in 2010, Financial Times/StarMine named Albrecht #3 in road and rail for his stock picking. If you have any questions about this resource, please contact solutions@tranzact.com. * We never rent, sell or otherwise share information submitted through our website.